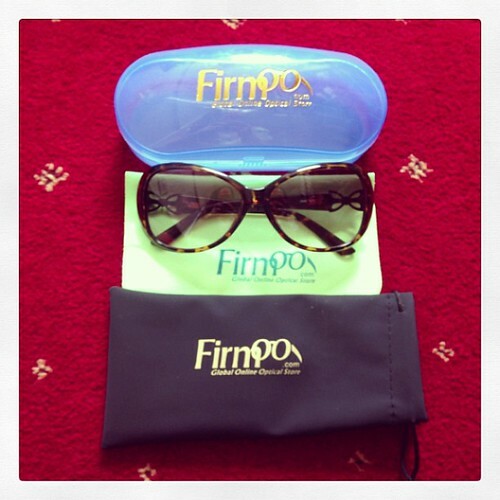 For the second time since starting my blog I have received a beautiful pair of sunglasses from Firmoo.com. The last time I went for a more funky rock chick style as you can see Here and this time I decided to go for something a little more glamorous and elegant. I chose these beautiful tortoiseshell frames with bow detailing on the side, perfect for the ultimate girly Summer style. Firmoo are a fabulous onine eyecare company offering everything from prescription glasses to a beautiful variety of stylish sunglasses. Their selection process on the website is so simple and straightforward and they even offer the first pair of frames free to new customers. Firmoo are one of the most professional companies I have worked with, their customer service and efficiency are second to none as well as their products being of a great standard and high quality. This pair have the most beautiful tinted glass which make everything look bright and sunny, ideal when you live in Ireland and it is generally grey and dull. Howvever, they could not have arrived at a better time, we can actually see the first glimpses of Summer sunshine breaking through the clouds and I now have my perfect accessory to shield my eyes from the rays! I would like to say a huge thank you once again to Firmoo and I highly recommend them to anyone wishing to purchase a top quality pair of glasses or sunglasses this season! I love the sunglasses. You bag is fab! Muy bonitas las gafas, la chaqueta preciosa!! I love your sunglasses and as importantly your bag!!! i love your outfit & your sunnies are lovely! Que monada de bolso guapa. coolest sunnies n necklace. I want the lv. You look awesome, your necklace is gawjuss and your eye wear suits you so well.